I’m excited to have the opportunity to present a new webinar on Simple K12 this Tuesday, Digital Storytelling with Interactive Images & Video. This webinar will feature some of the most recent work I have been engaged in, creating interactive image books for teaching and learning. Every image has a story – and you can help those images come to life and tell deeper stories with ThingLink EDU. Join me and Simple K12 as we demonstrate how authors of all ages can use ThingLink EDU to tell engaging digital stories by easily adding an interactive layer to images and videos. When a reader moves their mouse over images or videos annotated with ThingLink EDU, they can explore additional information, listen to songs, watch videos, or answer polls without leaving the page. We will share how to create an interactive image, as well as how to turn multiple images into interactive image books that are sure to meet the diverse needs of all learners. Come explore the powerful possibilities of digital storytelling with ThingLink EDU. 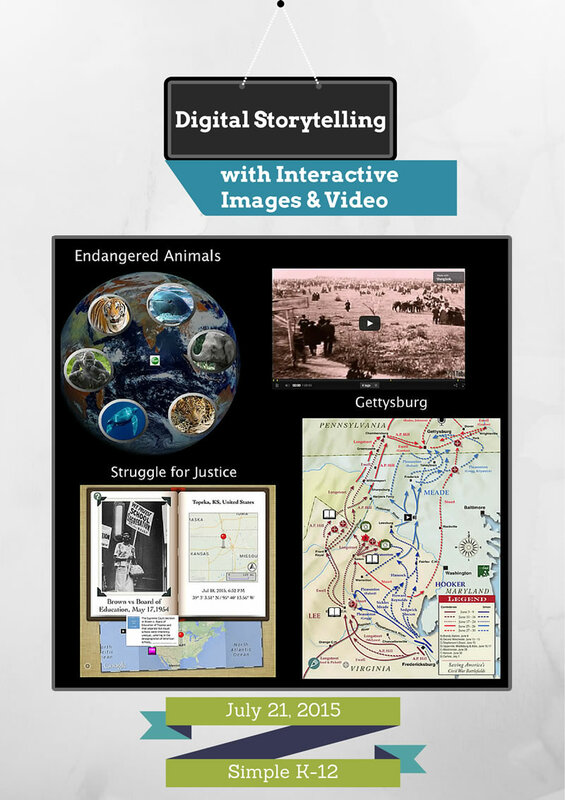 Explore this interactive image to view some examples of ways to tell a digital story through rich media and text. Click on the pencil icon to sign up for this webinar. July has been a busy month for me and I have been working with many different groups of teachers in many different locations. If you are looking for resources, my interactive calendar is a good place to start. View the full calendar to access resource at anytime by clicking on the link at the very top of this blog.